The competition to land Jimmy Butler from the Minnesota Timberwolves could be about to heat up. The Miami Heat are reportedly interested in making another run at Butler, while the Houston Rockets have reportedly turned down an initial offer for the four-time All-Star, according to an ESPN report Wednesday. Miami's attempt to acquire Butler unraveled last week when the Timberwolves wanted a better player in return than guard Josh Richardson. Meanwhile, the Rockets received an overture in which Minnesota requested shooting guard Eric Gordon and power forward PJ Tucker, but Houston wasn't interested in parting with Tucker, per Wednesday's report. Three weeks since he requested a trade, Butler practiced with the team for the first time Wednesday in an apparently heated session. According to ESPN, he verbally challenged teammates, coaches and front office executives, and left many speechless. Per the report, an emotional Butler targeted president of basketball operations and coach Tom Thibodeau, teammates Karl-Anthony Towns and Andrew Wiggins, and general manager Scott Layden, at whom he screamed at one point, "You [expletive] need me. You can't win without me." Veteran point guard Jeff Teague said Butler's behavior didn't bother him. "I've been around the league," Teague told reporters. "It's my 10th year, so I been a part of teams where a lot of things have been going on. It's part of the game. I don't think it's distracting me. It may be distracting some other guys. Either way, man, I love Jimmy. Jimmy is my guy. But if he's not here, then we've got a good team, too." Butler has told the organization he will leave as a free agent next summer if he isn't traded. Thibodeau has been hoping Butler will drop his trade request, while owner Glen Taylor desires a quick resolution to the deal. Proposals figure to pick up again this week with Minnesota's first game looming against the San Antonio Spurs on Oct. 17. 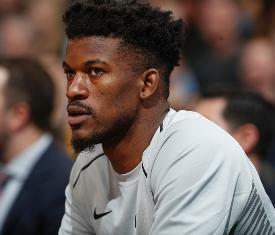 According to reports, the Los Angeles Clippers, Phoenix Suns, Cleveland Cavaliers, Houston Rockets and Sacramento Kings have also kicked the tires on a Butler deal. The Brooklyn Nets and New York Knicks also could emerge possibilities.